Prepare to be thoroughly amazed. 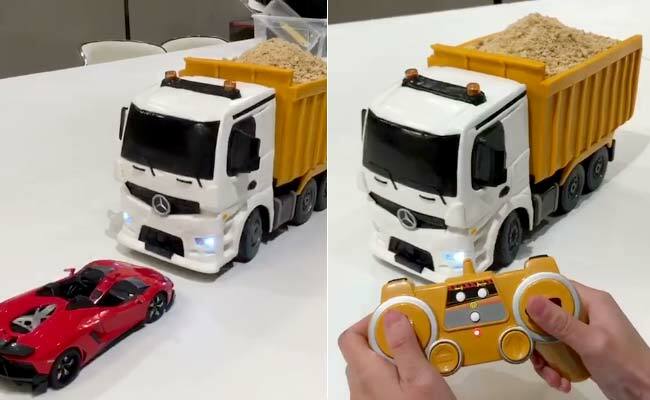 If you're looking for something to blow your mind today, this adorable little toy truck video may just be it. But what, you may ask, is the big deal about this particular tiny truck? Isn't is just like other remote-controlled toys out there? Well, that's the catch. The truck isn't really a toy but actually a cake. The video has been posted on the Pandora Cake Shop Facebook page. Shared on February 24, the video has collected over 1.7 million views so far. It has also amassed almost 23,000 shares and over 12,000 reactions. The video first shows the truck moving about and eventually the big reveal takes place when a woman, most likely the baker, cuts into it. Tada! That's actually a toy truck you can eat. Another video posted on the page a day later shows two very real looking bags, one of which is actually a cake. However, we won't disclose which one is the cake and which one is the bag. You'll just have to watch the video to find out. This video too has collected over a million views, some 11,000 reactions and over 14,000 shares on Facebook. Aren't these cakes totally cool? Too bad this bakery is based out of Hong Kong.